Plans to increase Harrogate Town AFC's ground capacity to 4,000 have officially been approved - as work on three new terraces at the field nears completion. Councillors retrospectively approved the project at a planning committee meeting on Tuesday in front of a packed chamber. Councillors were told how Harrogate Town had to commence work on the three terraces before receiving council approval in order to meet a tight deadline imposed by the English Football League (EFL) following the club's promotion to the National League in May 2018. The EFL's stipulations meant Harrogate Town had to increase the capacity of the ground to 4,000, including 500 seats, to comply with the sporting authority's requirements, as well as to "future proof" the ground should the first team be promoted again. Speaking on behalf of residents, Coun Chris Aldred (Lib Dems, Harrogate Fairfax) claimed there was an "unfortunate history between the club and its neighbours". 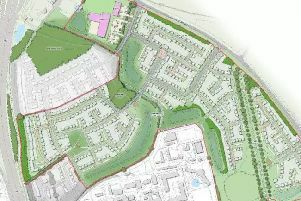 Coun Aldred said that he had been contacted by former Harrogate borough mayor and councillor Michael Newby, who he claimed had said: "The club have treated both local residents and the planning process with, at best, a lack of respect, and at worst total contempt" in building before gaining approval. He said it was up to councillors "protect the amenity" of local residents who were concerned about "excessive noise issues" they feared could arise from the expanded capacity. In response, Coun Phil Ireland said that the expanded capacity would be a positive for Harrogate's various other football teams, including women's sides and junior teams. "It's pulling them out of their bedrooms, away from their Xboxes,” Coun Ireland said of the positive impact a strengthened club would have on Harrogate's youth. Coun Zoe Metcalfe asked why the three new metal terraces were made with metal instead of concrete, causing them to be "very noisy when you walk on them". Harrogate Town's agent, David Smith of planning firm WSP Indigo, answered that a crowd of people "dampens the effect" of the sound of metal compared to a single person walking on them. He added that "speed of delivery was important as well", with the metal stands enabling a quicker build than concrete. Mr Smith said they were "aware the noise impact of the stands is a key consideration" and that a noise mitigation plan submitted to council aimed to address those issues. Councillors were also told that while the three stands means they’ll have a greatly increased capacity, general attendance at first team matches hovers around 1,500 currently. Coun Metcalfe also asked about the necessity of the stands being built so quickly, to which Harrogate Town manager director Garry Plant responded it was necessary to be eligible for promotion and not be relegated for failing to meet the EFL's conditions. “No business wants to go down or backwards, does it," Mr Plant said. "Our crowds have grown, as we know (and) relegation would take it backwards." Coun Pat Marsh asked the managing director about communication with residents, and whether the club could "develop a regime so they're talking to residents regularly". Mr Plant responded that the club had commenced a newsletter earlier this year which is distributed to local residents with updates on the team's position as well as information about development at the ground. Coun Marsh reiterated her views that "undoubtedly, we've got a ground in the wrong place", citing issues with parking and that the field was "on top of residents". She added that she would support the application, but if the club continued its success it would eventually outgrow the site. Through debate, councillors then came up with two additional conditions for the project - the first being that the new terraces are only used when Harrogate Town's first team is playing, to which the club agreed. Another condition was added for additional visual and sound-proofing screening be erected near the terrace on Wetherby Road, because of the stand's proximity to a household on the road. This too was agreed to by the applicant. With debate done, the item was put to the vote, with all 12 councillors in favour of approving the work. Harrogate Town currently sit at sixth in the National League, the fifth tier of English football, following their promotion from the National League North in the 2017–18 season.